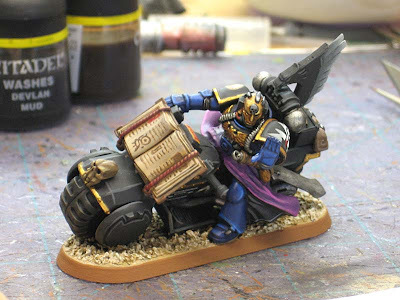 Here a re a few thoughts and pics of a power armoured Librarian mounted on a bike for DIY Chapter commission. This is part of an ongoing commission I have that includes all those bikes i posted a while ago. I did a Terminator Librarian for the force towards the beginning and now it was time to put one on a bike. I was given the shell of the model and told I could finish him however I wanted. In this case, I decided to keep him simple and not add much more to the model than was already there. I did switch the legs out to make them robed (so I could add the purple color the rest of the army has) and then added a power sword as well to show he is armed. The sword idea actually came from my Client, I struggled with his pose and how to make him look like he was mounted on the bike (and holding on!) and still carrying a weapon at the same time. Since I liked the idea of him holding out his hand, I went with that and the weapon came second. I knew when I got the pieces, I wanted to make him leaning to the side since no other bikers are doing that. It was a simple conversion as I glued one half of his legs in place and then moved the other one out until it could touch the ground when he leaned to the side. A little greenstuff at the joint and you can't even tell. His head was a bit of a challenge. I was given the Blood Angels head with the crest cleaned off. I liked the look of the head and decided I could do something with it. I cleaned up the hair off the back and sculpted a low psychic hood around his head. I was careful not to cover the small cables he had at the front attached to his jaw, they looked cool and were definitely worth keeping. I added a bunch of cables up onto his head and then added the power cables down his chest attached to his torso. While it might seem minor, this is the first psychic hood I've sculpted where the cables are not symmetrical. I sculpted each one thinking about how they would be positioned in relation to how he is moving. I think it helps convey a sense of movement to the model. Great model! 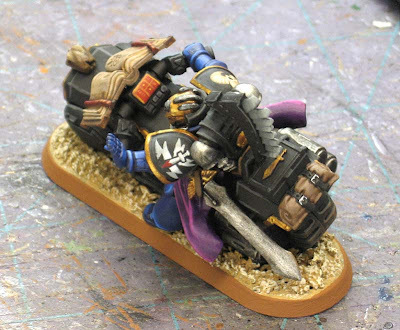 I agree with how impressive the minor conversions make the over-all model! One question- the wheel covers, are those from the rhino kit or from one of the tau kits? I always love to see bikers in action poses instead of just 'riding' down the road poses. Yours is good stuff. DrGabe: Thanks. If memory serves me correct, they are Tau pieces. Now which ones exactly, I'm not sure. Absolutely amazing as usual. You work is very inspiring! BJ: Thanks, my painting is improving now I have some new and "better" brushes as well. That's some good conversion! 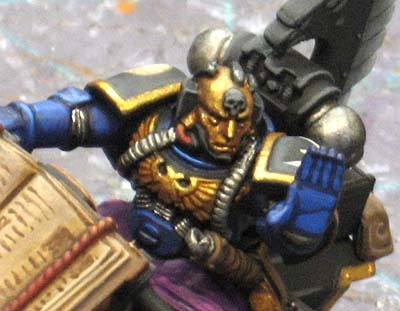 I'm liking the head mask, it's an interesting counterpart to a Chaplain's skull helmet. Custom psychic hoods give a lot of character to Librarians. As usual, your minis are inspiring. Thanks for sharing them! I like this. 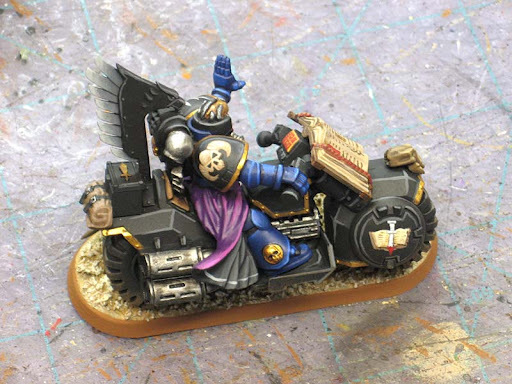 Not sure about the complete lack of gun on the bike though, I would propably have put it where the skull is on the front. Where is the book and the frill at the back over the backpack? Did you sculpt them? lyracian: Thanks. The lack of a "gun" could be an issue depending on how strict your opponents are. I believe the book is a Dark Angels bit and the pieces along his back is from the Ravenwing sprue. I just cut it down some to make it low profile so it would fit in the carrying case.